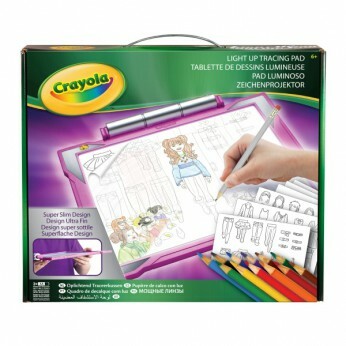 The light up tracing pad lets kids trace and colour detailed scenes. The ultra-thin tablet design and bright LED drawing surface make tracing easy. Start tracing right away with the content inside, then download 100s of images online. Requires 3 x AA Batteries not inlcuded…. This toy costs approximately £12.49 (for the latest and best prices make sure you check our retailer list for the Crayola Light Up Tracing Pad above). In our review of Crayola Light Up Tracing Pad we classed it as being suitable for ages 3 years, 4 years, 5 years but recommend you check the manufacturer specific advice before purchasing.